I just got back from my doctors appointment at Hamad General Hospital that's why my posts for the day are coming in later than usual. We apologize. 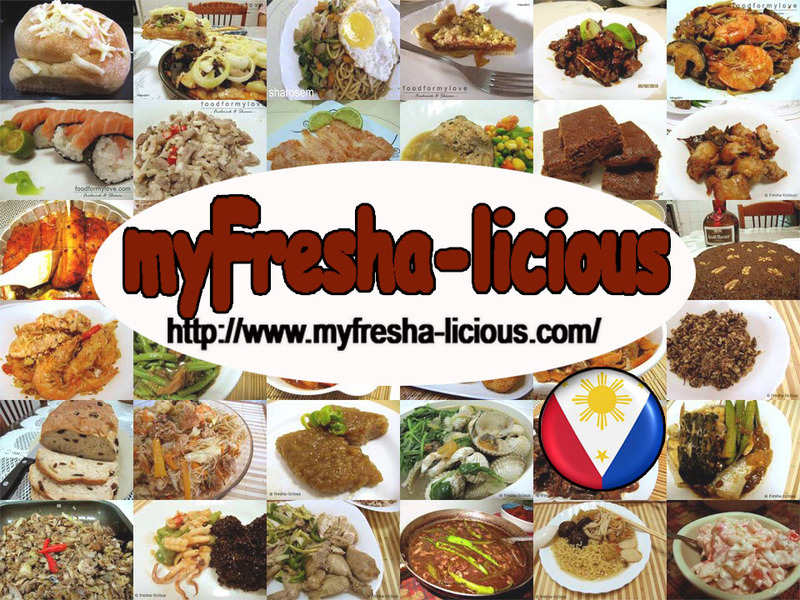 Anyway, our goal for our blog, myFresha-licious, for this year is to publish more Filipino recipes. And for this week, we will be posting Filipino fish recipes. With that in mind, and because I have ran out of ideas on how to prepare and cook fish the Pinoy way, I requested a Filipino fish recipe from a good friend of ours who is currently based in Dubai (Grace Rios). I know she cooks too (and good at it) as I see some photos of dishes she cooked posted in her FB page along with praises from her friends who were lucky to have tasted her dishes. Pesang Isda (in this case Tilapia) is a soup dish that consist mainly of fish, vegetables, and spices like ginger, onion, and black peppercorns. I had mentioned in our post on Pesang Manok that this dish might have been influenced by the Chinese as pesa is a Chinese word that means "plain boiled" which perfectly describes this dish. 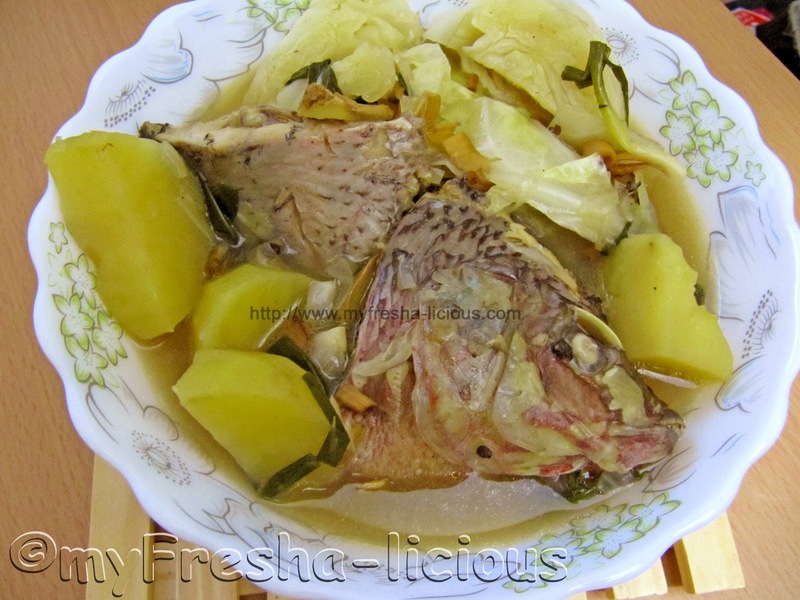 There are many variations of pesang isda and this one is based on Grace Rios' recipe of pesang tilapia. What is great about this dish is the combination of flavors from the lemongrass and the ginger. My tummy loved its warm effect. Thanks Grace for the recipe! 1. Place oil, black peppercorns, ginger and onion in a pot and saute until they are aromatic. 2. Add in the fish slices and flip it from one side to another until it changes in color. Remover from the pot and set aside. 3. Stir in the lemon grass the the potatoes. 4. Pour the water on the potatoes and season with magi magic sarap, fish sauce, and a dash of salt. Bring to a boil. 5. Simmer until the potatoes are soft then add the green onion leaves. Simmer for a minute. 6. Toss in the tilapia and the cabbage. Bring to a boil and continue cooking until the cabbage are soft. then yung patatas. pag medyo malambot na lagay mo na ung other vegs kasabay na din ung isda. salt lang to taste..
hehehehe sensya ka na, tantyahan lang ako sa water e , depende sa gusto kong dami ng isabaw. mas maraming luya/tanglad, mas malasa, para lang caldo.